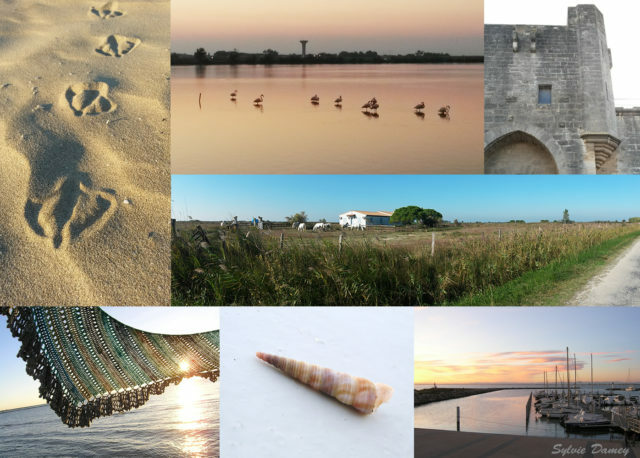 We spent a few days in Camargue last week and enjoyed long beach walks, cycling among salt marshes, black bulls, semi-wild horses and pink flamingos.. We visited the magnificent town of Aigues mortes and ate outside hearing the sailboats in the harbour. 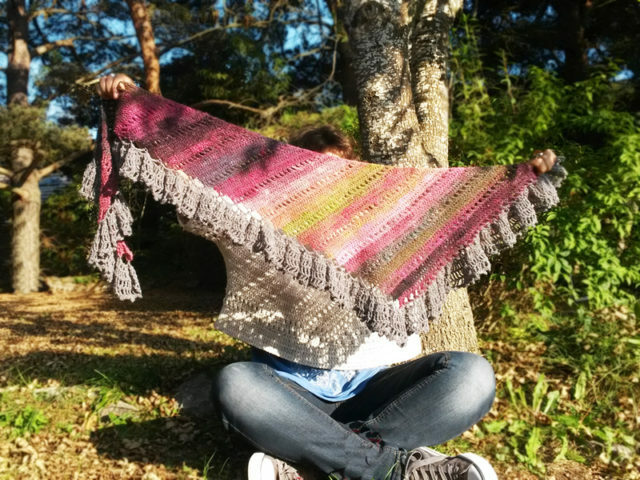 All this felt like the perfect setup for my new shawl design: the Camargue shawl ! 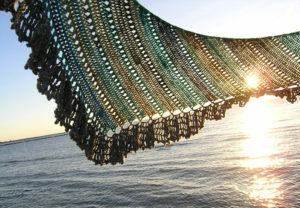 Camargue shawl is a sideways shawl with discreet lace pattern, finished a spectacular ruffled edging. 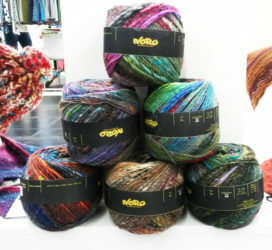 Make the most of the beauty of Noro yarns (or any other self-striping or handpainted yarns) ! 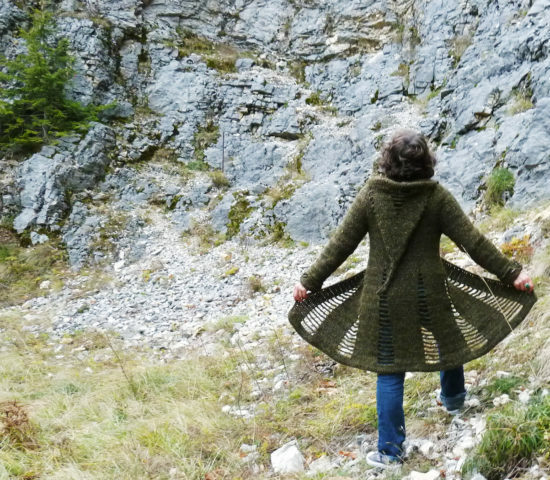 Dragon-tail shaped shawl, worked sideways. 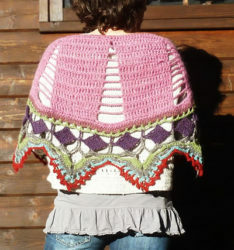 Ruffled edging is then added along 2 borders of the triangle. 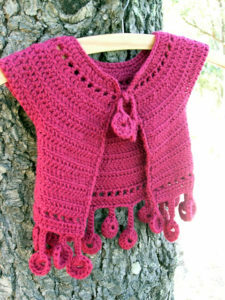 Instructions includes directions for 2 sizes of shawl: size 1 showed above in burgundy, size 2 shown in turquoise. 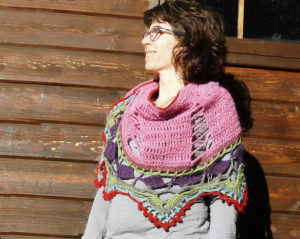 Designed so that you can customize the size of shawl, and/or use any yarn weight to make it. 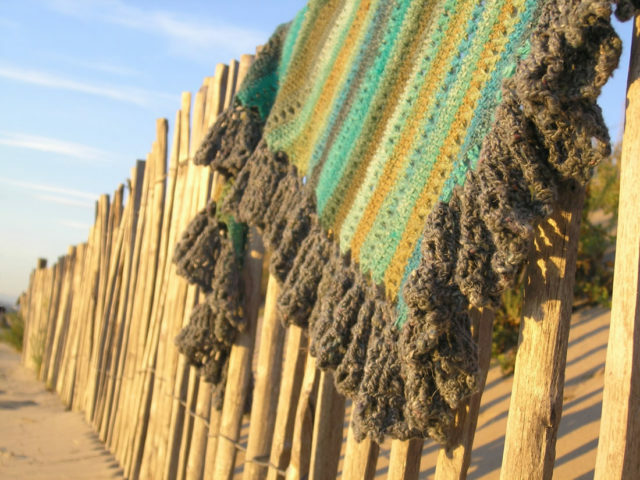 I have finally decided that on friday April 6th 2018 I’ll be changing all the prices of my patterns on RAVELRY into €uros. 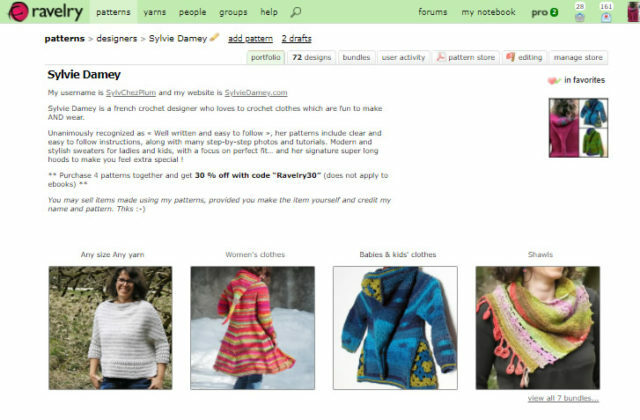 They will thus be aligned with the pricing of my main ETSY store SylvieDameyCrochet. 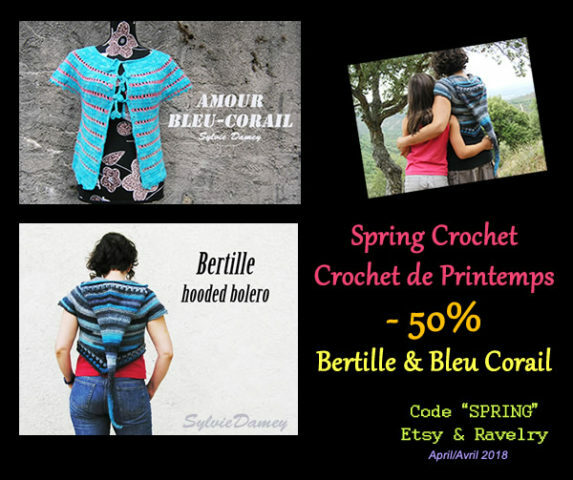 For those of you who prefer to shop in US Dollars ($), you will still be able to do so on Craftsy or my 2nd Etsy store FrenchStyleCrochet. 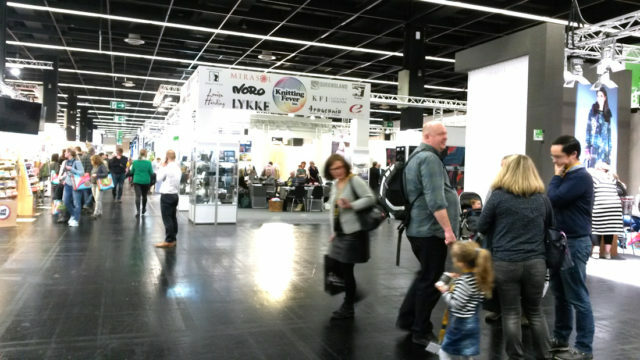 Last week-end I had the opportunity at the last minute to visit the h+h trade show in Cologne, Germany, with a friend. 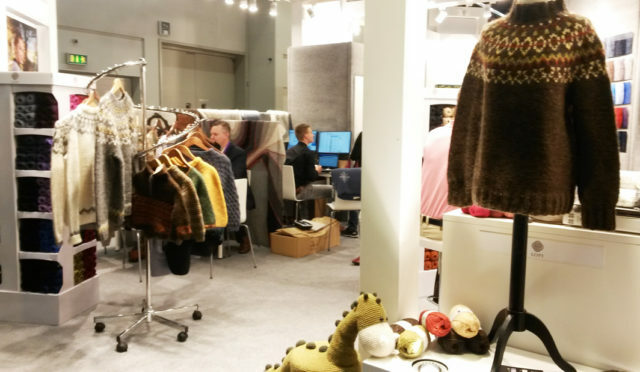 This is a huge show reserved for professionals and retailers, who come from all corners of northern Europe to shop for new products and yarns. 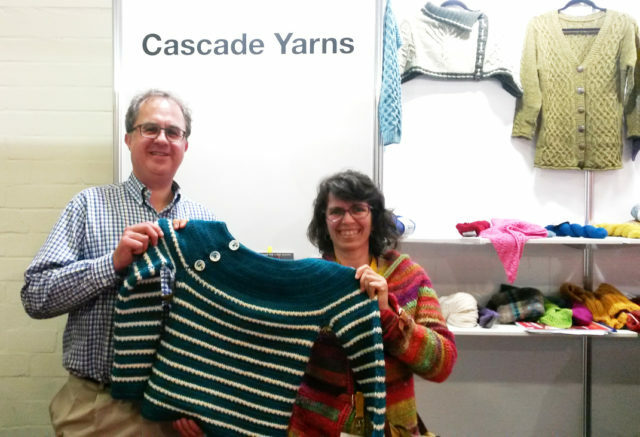 I got to meet Rob and Sharon Dunbabin, owners of Cascade yarns.. and show them my newest design, the “Marin d’Odouce” sweater made with their wool 220. 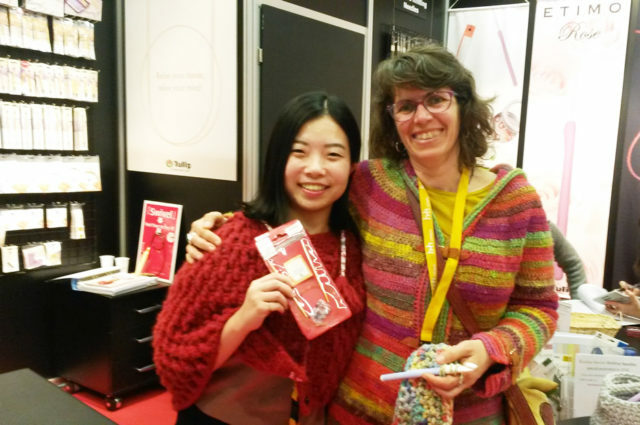 It was really great to be able to chat with them about their company and yarns, I loved it ! 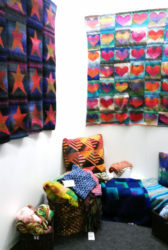 Finally, of course NORO was another of my go-to places. I mean, don’t you loooove those huge 200g balls of colored yumminess ? 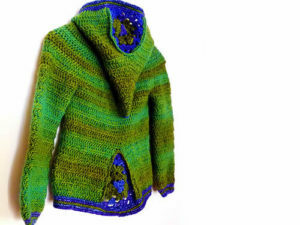 Here again, contact was made and I hope it will indeed lead to successfull colloboration for designs, as I love the Noro yarns so much ! 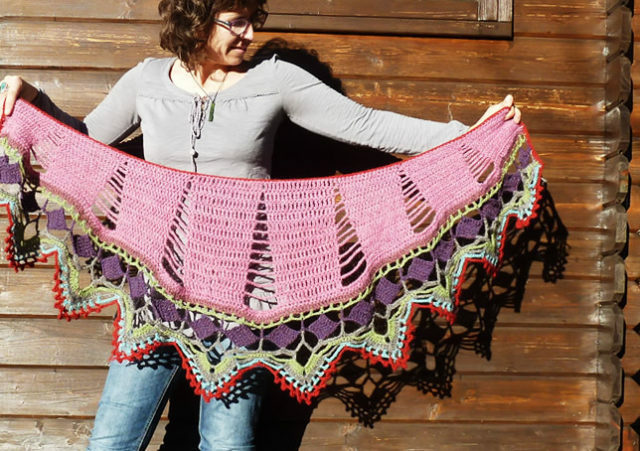 The Open Spaces shawl is a new shawl design, where you’ll see the same “open spaces” openwork as in my “Open Spaces coat”, plus a bold lace edging derived from a vintage Victorian lace. You can make this shawl in 2 sizes, using either super bulky yarn (and fewer stitches) or worsted/aran weight yarn (and a few added sts in each panel). 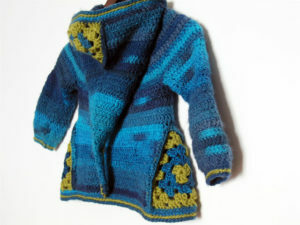 For the super bulky version, I used the exact same combo of several strands of yarn held together as for the matching coat. 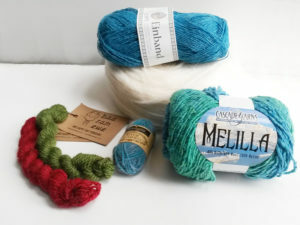 Finally, I continued to dig through my stash and came upon enough Cascade “wool 220” to make a 3rd sample, this time in worsted weight yarn. 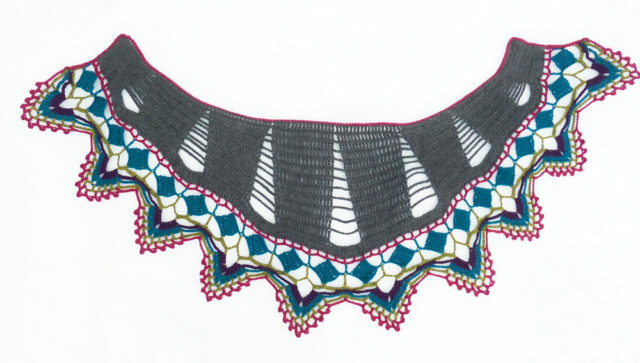 I just love how you can arrange colors differently to make each section of the lace border pop . 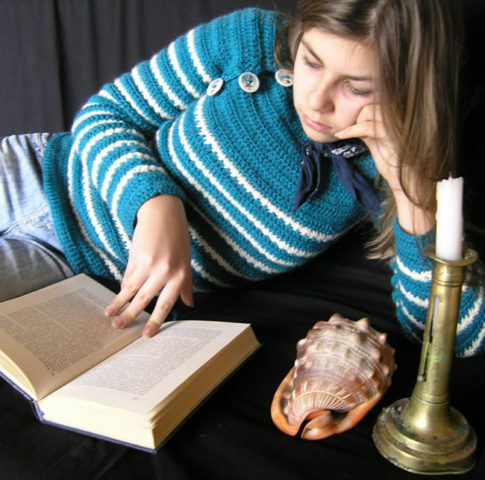 Pattern is in pdf format. 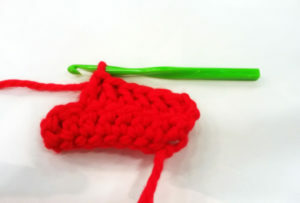 You may sell items crocheted with this pattern, please mention my name and pattern. 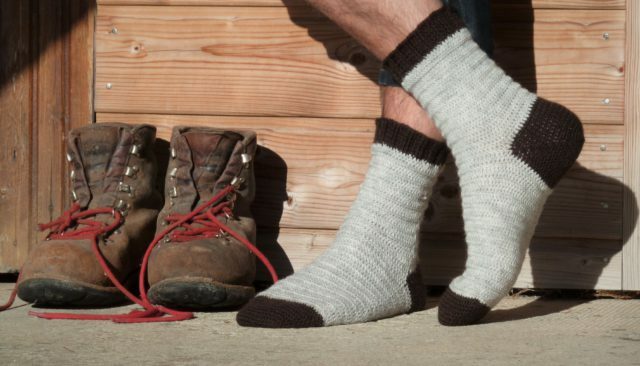 So here they are: the Bucheron socks (= lumberjack in french). Classic hardwearing socks, with contrasting heels and toes, and an edging of fake-ribbing I particularly like. 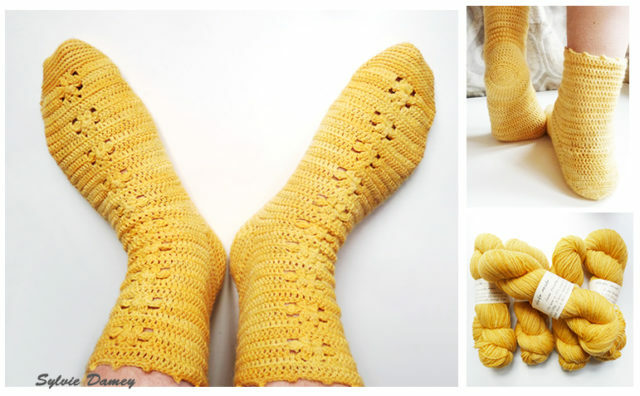 Those socks are explained in 4 widths, from thin women’s feet (or older kids) to large men’s feet, so you can crochet socks for the whole family. 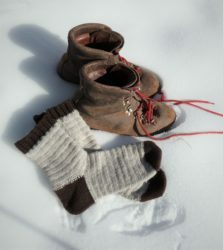 And of course, the length of the socks is fully customizable. Constructed with afterthought heels, you will be able to replace the heels of those socks if they ever wear out. 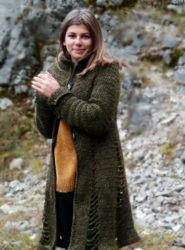 The Open Spaces coat is the perfect mix of style and comfort, when you want to be nice and cozy in the winter. 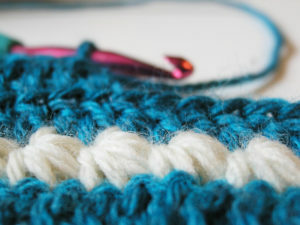 Crocheted with Super bulky yarn, it is amazingly quick to crochet with all these “open spaces” (chains are soooo much faster to make than full stitches). 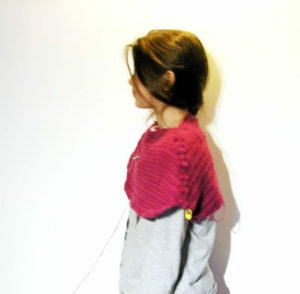 The hood is totally optional, so you can wear it in a much more classic way. 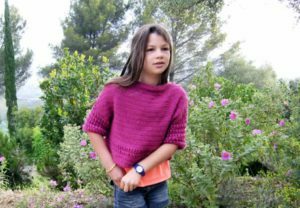 The pattern is available in 5 sizes from XS to XL. 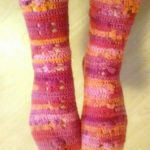 Starting something completely new (to me)… Crocheted socks ! Yet I still kept that idea in a corner of my mind. 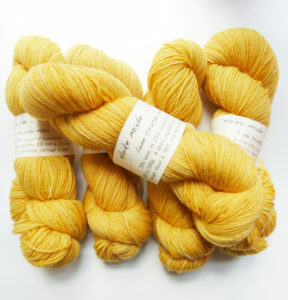 Oh and sock yarns can be so pretty ! 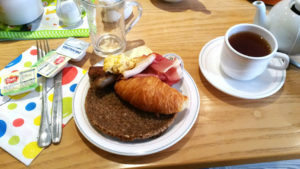 BINGO ! So last November I started away on my very first socks. 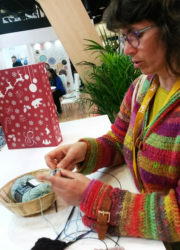 I intentionnally avoided to look at socks from other designers so I would not be influenced … I wanted to find my own ways to crochet a sock. 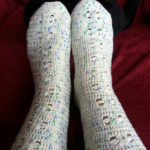 I made a few pairs of crocheted socks before, but have not found a design I want to make more than once. 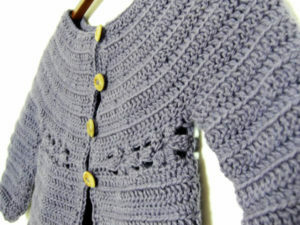 This will be my go to pattern in future! 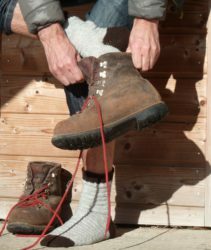 As for wearing, it’s maybe too soon to say, but the biggest difference compared to knitted socks is that these don’t feel tight and still they don’t fall off my feet either. 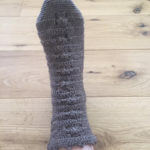 this is a fantastic crocheted sock pattern. 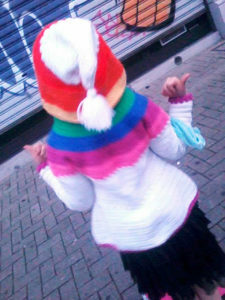 A lot of others come off more like a Christmas stocking, rather than an actual sock that you feel comfortable wearing. 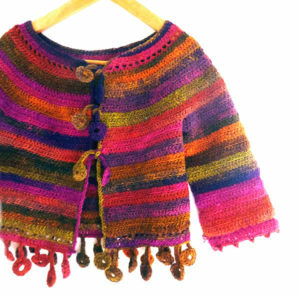 They were just the right combo of interesting yet easy … they were fun to make. 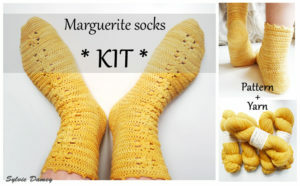 (…) I have not knitted socks but I have crocheted socks and these are my favourite! I absolutely loved making these!! I definitely plan on making another pair. 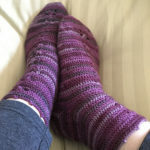 (…) I have tried to crochet socks before but none of them had the afterthought heel and were nowhere near as comfortable and I ended up frogging them. I was so satisfied with this experience and will definitely be making more of these in the future! 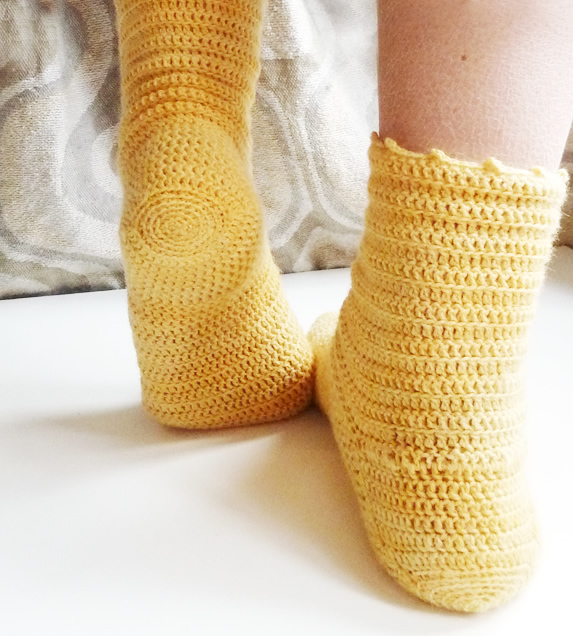 I’ m so happy to finally have a crochet pattern for socks. 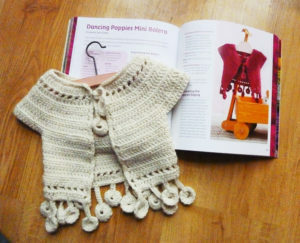 These are so much more fun to make than knitted ones! 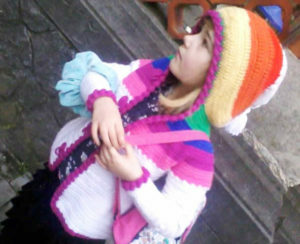 And so pretty, too! 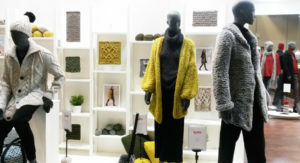 You created a lovely, much needed design! 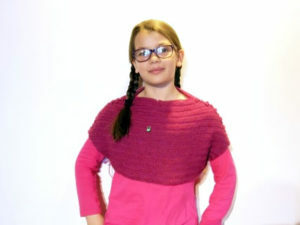 instructions in 3 widths so you can make those to fit your feet perfectly ! 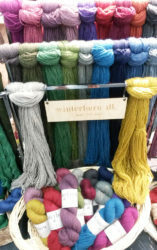 Sock yarn is made of 75% wool (5 different breeds, including merino, are mixed to achieve the best ratio softness/resistance to abrasion) and 25% nylon superwash. 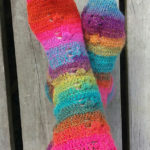 THis yarn was dyed especially for these socks by indie dyer Heikemade with subtle variations of tones so as not to hide the floral motif. 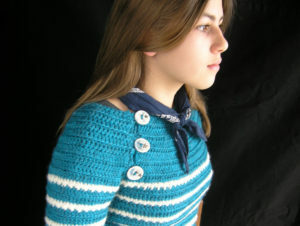 She made longer color repeats so they would work perfectly when crocheted in double crochets. 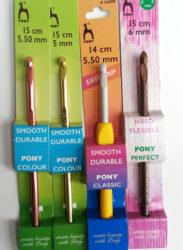 Each kit includes also 4 stitch markers (used in pattern) including one “heart-shaped” marker from Addi. 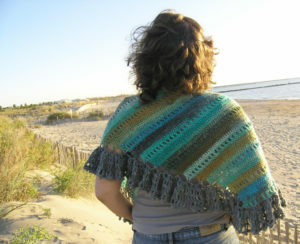 Kits are available in my Etsy store and at the “Lot et laine” fiber festival in July (France).